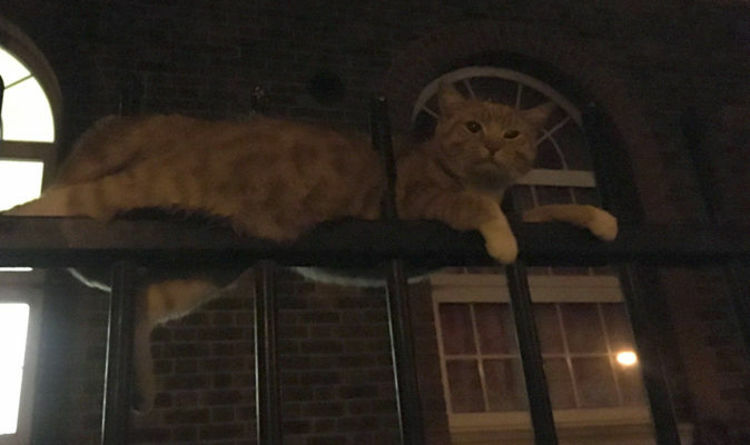 Shocking images showing metal railings protruding through Skittles’ body as he was being rescued by the London Fire Brigade went viral, with few believing he could survive such a disastrous accident. Eight months on and Skittles’ remarkable recovery has seen him join two other cats – Dexter and Maximus – as well as Brandy the dog on the shortlist for this year’s prestigious title of miracle pet. To this day, Skittles’ owner Shanakei Forde still cannot fathom how he was not killed when he became impaled on metal railings near her home in north west London. Ms Forde said: “When I saw the pictures I couldn’t believe my eyes that it was him. “It was so shocking. It’s a miracle that he survived, and was still alert even with those poles stuck through him. Firefighters had to move Skittles with the railings still poking through his body before vets could carry out precision surgery. Somehow the three poles had missed his vital organs. There was still need for two further operations, provided at Hendon PDSA Pet Hospital, but within weeks Skittles was out exploring again and his latest photograph gives no clue to his death-defying antics. RSPCA Deputy Chief Inspector Nicole Broster, who was one of the first on the scene, said: “In all my years with the RSPCA I had never seen anything like this. "I was amazed that this lovely, affectionate cat was still alive, but I knew I had to get him urgent help to give him the best chance of survival. “We’re delighted that’s he’s now reached the finals of the PDSA Pet Survivor Awards. This is testament to all the people involved in his rescue and recovery, from that first member of the public, the emergency services, all the vets and nurses who have provided treatment, and of course his loving family. This year’s competition was open to any pet treated for a life-saving illness or injury by a vet between January 1, 2017, and August 31, 2018. Voting is open until November 30. Only one vote per person. The winner will be announced before Christmas and will win a luxury pet hamper and a trophy.